Home/Comics/Read Call of Duty: Black Ops 4 Tie-In Comics for Free! Activision/Treyarch launched a 10-part comic book for its community to enjoy while their newest game is released. As part of the promotional material for the release of the highly anticipated new entry in the wildly popular video game shooter franchise, Call of Duty: Black Ops 4, Activision/Treyarch launched a tie-in comic book series that Call of Duty fans will be able to enjoy for free. The story will be told in ten issues, and comes from the celebrated comic book writers Greg Rucka (Batwoman), Chris Roberson (iZombie), Jeremy Barlow (Star Wars), K.A. McDonald, Aaron Duran (The Last Bruja), Matthew Robinson, and Tony Shasteen (Star Trek, The Vampire Diaries). The illustrators of the Call of Duty: Black Ops comic include Adam Hughes (Catwoman, Wonder Woman), Eric Wilkerson, Kirbi Fagan (Mockingbird), Dan Dos Santos (Fables, Serenity), and Julian Totino Tedesco (Spider-Man: Amazing Origins, Ant-Man: Astonishing Origins). 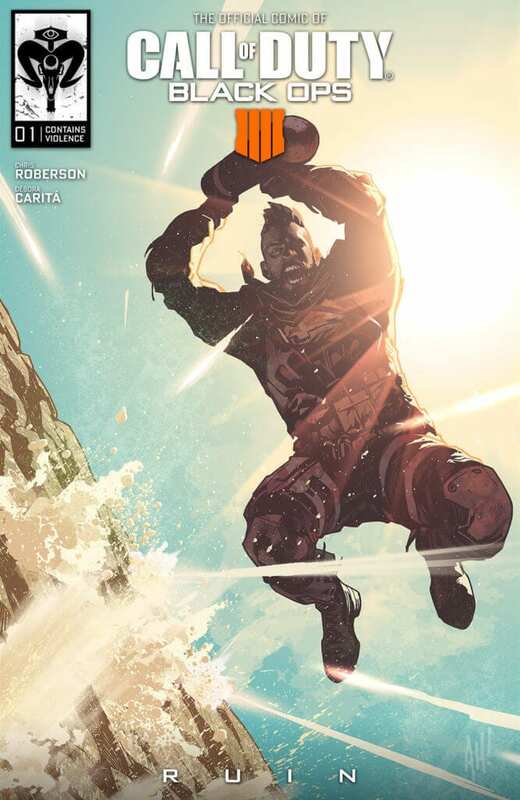 The first 3 issues of the Call of Duty: Black Ops comic – focusing on the “Specialist” characters of Ruin, Prophet, and Crash, respectively – are out now and can be read at https://www.callofduty.com/blackops4/comics completely for free. This jibes with Treyarch’s desire to increase fan engagement with Call of Duty: Black Ops 4; how better than to get people excited for the game early with a tie-in Call of Duty: Black Ops comic? Call of Duty: Black Ops 4 will be available for all platforms on October 12th, 2018.